I am a landlubber, but I love all things maritime whether it is naval ships, submarines, or the days of wood and sail. It started with Joseph Conrad’s sea stories and carried on through those of James Fenimore Cooper and C.S. Forster. Then there were the classic true-life sailing experiences of Richard Dana Jr. in Two Years Before the Mast and Joshua Slocum’s Sailing Alone Around the World through which I lived a vicarious life on the sea. While I have been on a small sailing craft (on Lake Ontario), I have never actually been on any type of craft on the ocean. I’m really an armchair adventurer, so I’m often on the lookout for books that take me to different places and put me in situations that I’ll likely never encounter. 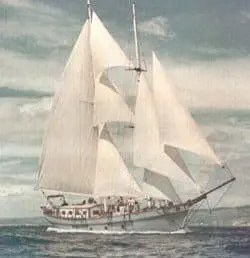 Schooner Valkyrien in better days. Sea Change (2018, Islandport Press) is such a book. Maxwell Taylor Kennedy is, amongst a host of other things, an accomplished sailor, particularly on the waters around Cape Cod. He is on the board of the Pearl Coalition, a Washington DC non-profit group dedicated to memorializing the schooner Pearl, on which 77 African-American men, women, and children were trying to escape slavery in 1848. Mr. Kennedy wanted to find an existing schooner similar to the Pearl, to bring to Washington as a museum ship. He found a similar schooner in a very dilapidated, but salvageable condition in California, the Valkyrien. It was his dream to sail her from California to Washington DC via the Panama Canal. 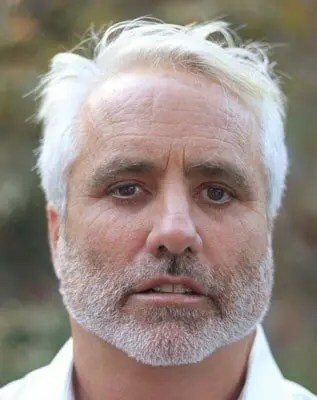 I’m not so sure about personal demons, for Mr. Kennedy is a fairly well-grounded person (he is the ninth child of the late Robert F. Kennedy) with a loving, supportive family. I believe the demons were already waiting aboard the Valkyrie (recall the crows) and would have been visited upon anyone trying to sail her out of that lonely berth in California. The voyage, however, brought out the best – and sometimes the worst – in Mr. Kennedy, but as he mentions in the book, he prefers to face danger head-on rather than dwell on any imagined fear that might grieve him. Sea Change is a riveting sailing story, deeply thoughtful and startlingly honest in the telling. Here is a man that can take control of any situation at sea, and the outcome, while not always pretty, was one that at the very least spared your life. Whether you read this book for pure escapism or to satisfy a nautical interest, as a sailor or a landlubber, Sea Change will richly reward the attention of any reader of true adventure. *Please note if you choose to purchase this book through Amazon using the link below I will receive a small commission at no extra cost to you. If you cannot see the Amazon ad below (if you are using an ad blocker, for instance) here is the link: https://amzn.to/2LfdqbR Thanks! It was just one thing after another on this boat.I’m surprised he survived!